Like Samuel Johnson, I find myself back in Lichfield regularly, staying in a variety of places, and last week I stayed in Saint John’s House on Saint John Street. Earlier in the year, I stayed at the Hedgehog Vintage Inn on the northern fringes of Lichfield, in a semi-rural setting on the corner of Stafford Road and Cross in Hand Lane. At one time, the bar in the Hedgehog was festooned with quotes and words od advice from Samuel Johnson. But perhaps every pub in Lichfield would like to claim a link with the good doctor. 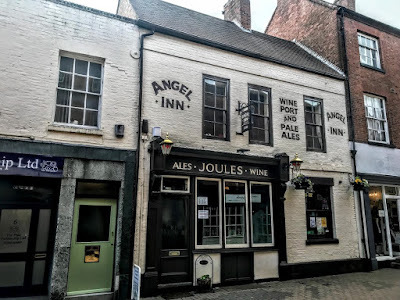 The Angel on Market Street is one example of a pub that tried to do so. The Angel Inn is a mid-18th century pub on Market Street, just a few steps away from the Samuel Johnson Birthplace Museum on the corner of Market Street and Breadmarket Street, and close to both the Scales and the former Castle on Market Street. Market Street is a busy pedestrianised street in the heart of Lichfield, and the Angel at No 4, at the west end of the street, close to the corner with Bird Street, is an interesting survivor of the small parlour pub, claiming a rich heritage. But all that was almost lost at least twice in the recent past. A sign hanging outside the pub claims the Angel dates from 1706, which is three years before Samuel Johnson was born a few doors away on 18 September 1709. However, the first reference to the Angel is from around 1750, and it was a thriving pub by 1800. In the early 19th century, this was one of Lichfield’s celebrated coaching inns. In 1828, a coach ran from here to Birmingham at 8 a.m. each morning. At first, the coach was known as the ‘Coburg,’ but by 1834 it had been renamed the ‘Shepherd,’ after the landlord of the day, Joseph Shepherd. In the 1850s, Edward Orgill was the landlord of the Angel. Later Charles Small ran the angel from 1885 to 1904. The name of the pub was changed in 1978, and it became ‘The Samuel.’ John Shaw feared the change would mean the loss of many of the original features. However, it returned to the being called ‘The Angel’ at the end of 2014, when it re-opened and reclaimed its original name. It is now owned by the Joules Brewery. The cosy snugs and corners parlour pubs for which it was once famous have been carefully recreated, and the Angel is now home too to a range of interesting memorabilia and inviting real fires.